No more than glimpses of what once existed are revealed to us in the ever changing languages, religions, myths and legends. But, sometimes the painstaking effort by scientists can give us a few facts that can raise the curtain of the past just a little. For instance, the legend of Atlantis may have had its origin in the existence of a people who occupied the island of Santorini, but who then disappeared when that island experienced a tremendous volcanic explosion. Current excavations are promising to give a basis for some of the legends about Atlantis, but, usually, however, legends and myths are all that remain of what could well have been a rudimentary level of organization. David Steadman, a paleontologist, and others, have been engaged in a systematic excavation on Easter Island intended to identify the animals and plants that once lived there. As Jared Diamond writes in Discover magazine, Easter Island is the most isolated scrap of land on earth lying in the Pacific Ocean more than 2000 miles west of the nearest continent, South America, and 1,400 miles from even the nearest habitable island, Pitcairn Island. Its mild climate at 27 degrees south, and its fertile soil should make it a virtual paradise. The island derives its name from its “discovery” by the Dutch explorer Jacob Roggeveen, on Easter, 1722. The island that Roggeveen saw was grassland without a single tree or bush over ten feet high.” Roggeveen was met by a people who either swam or paddled two or three leaky canoes and who claimed memories of ancestors who visited an uninhabitable reef 260 miles away, far beyond the reach of the primitive canoes that met Roggeveen in 1722. The winters on Easter Island were cool and wet, but there was no source of firewood for the islanders to warm themselves. 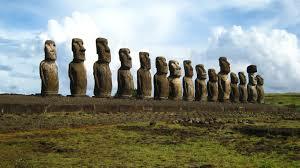 Easter Island is famous for its more than 200 statues which stood lining the coast. Some of the statues were as high as 33 feet and weighed up to 82 tons. Additionally, more statues, 700 or more, were abandoned and these were as great as 65 feet tall and weighed up to 270 tons. What happened to those people? There is no answer to be gotten from the memories of the people remaining. But, the hard working scientists in three fields: archaeology, pollen analysis and paleontology have, since 1955, continued to examine the historical record revealed by seeds, bones and pollen. It is probable that a population of up to 20,000 once lived on Easter Island and, in response to their chiefs or priests began to cut down the trees and bushes that they would need to make ropes and skid-ways to transport their statues the 6 miles from their quarry to the lineup on the coast. Eventually, this once sea-going people had sacrificed the materials they would need to build the craft that could carry them to fishing grounds or to an escape from Easter Island. This is reminiscent of our present logging practices of mindless cutting in the pursuit of jobs. The record uncovered by the scientists, gives us the story of a people stepping ashore about 2600 years ago on an island that could have provided all the materials they needed, if judicially utilized for a sustainable civilization. How they dissipated what they had until they were left with only the option of cannibalism can be shown by the findings of those scientists. The Easter Islanders lacked the realization that cutting down the giant palm which supplied food as well as wood for transporting their giant statues would make them prisoners on their island. Once the boats made from these palms could no longer be made, the people could no longer fish off-shore, forcing them to turn to the bird population and rats for food. Those rats had migrated along with the colonists to Easter Island and chewed the seed nuts of the palms, preventing them from germinating, creating a loss of future trees. Perhaps there is a parallel between those untended, lonely statues on the coast of Easter Island and our own so-called civilization. Planet Earth is larger than Easter Island, granted, but are we more intelligent than those people who stepped ashore on Easter Island 2600 years ago? One wouldn’t think so when we see what we have done to the forests, the oceans, the air and the very land that we must live on, and when we see people freezing to death on the steps of buildings whose warm interiors guard the artifacts of business and politics — money and the titles to phantom property. Are we not heading the way of past civilizations?